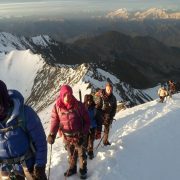 Size: 12-15 trekkers including Male and female. 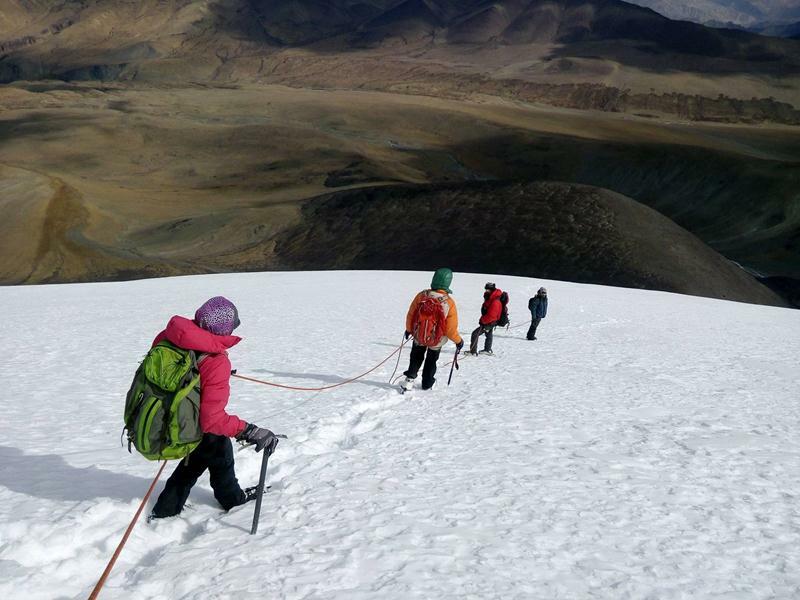 Kang Yatse II Peak Expedition begins from Leh. Arrive in Leh through flight or train. Your stay will be in the hotel after you reach. Leh is already at a height of 11,000 ft, hence you should be acclimatized pretty well. Use this day as an opportunity to rest and get your body acclimatized to the high altitudes. Good phone connectivity is available in Leh. You can use this day to shop for the forgotten things or rent equipment. Strictly stay from alcohol and smoking. If you arrive late, you can rest for the day. You can additionally roam around and get adapted to the culture. Leh is quite popular for its cultural treasures, monasteries, palaces and temples. Try to keep it low and easy on the body. Yet another day to get used to the low temperatures or to discover the splendid Leh! Apart from adventures and surreal scenery, Leh is well-known for its monasteries and palaces. Step into the history of Leh through the Shey Palace, Thiksey Monastery and ThikseyGompa. You can find thousands of adventure seekers or tourists in Leh during peak season. Try to interact with everyone to get used to the culture. Leh is famous for its cafes and hanging out places. If you wish you can try them. Again, strictly keep hands off alcohol and smoking. Apart from cultural heritage, Leh must be travelled for its passes and lakes like Nubra valley, Pangonglake. We do not allow roaming of trekkers to such places. This is to avoid strain on the body that might hurdle the process of acclimatization. Therefore, try to avoid moving to higher altitudes and stroll to nearby places. Enjoy your wonderful stay in the hotel. The drive from Leh to Chilling is like entering the ocean of barren, brownish yellow yet stunning region of the Himalayas. In the first half of the journey, major monuments Gurudwara Pathar Sahib and Spituk Monastery will quaintly welcome you. The silent and vibrant Magnetic Hill also passes by as you make your own way. Through the views of color changing rocks, dry grasslands you will cross the confluence of Zanskar and Indus rivers. 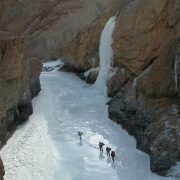 Chilling is a popular village of Leh known as the Base camp for Chadar in winter and river rafting in summer. The trek ahead incepts with a steep ascent going through Zingchen gorge. Amidst you will also cross the river on a trolley at Kaya-Do place. 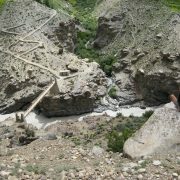 The trail many times comes across Indus River. Skiu will mark the first camping in the tents. It is located at the confluence of rivers Shgri Nala and Markha. The village has fairly 10-15 houses. They are also good for homestay and tea breaks. The habitat also has an old monastery. End your first day of the trek in Skui, looking forward to the upcoming thrills. The advantage of Kang Yatse trek is that it seamlessly overlaps with the Markha valley. Therefore, you can boastfully complete Markha valley trek too. And today is the day to witness the Markha valley. This will be the longest day of trekking with a total of 20 km of the hike. On this pretty long day, you will be welcomed by 3-4 villages and their rejuvenating hot tea. The first such village, Harding comes immediately after 2 hours of hiking. Keep walking ahead for another 2-3 hours, till you reach Chalak village. It is placed beautifully amongst the barley fields with mountains in the background. Again, have some tea and get all energized for the remaining trek. The next camping site is at Markha village, which is 5-6km from here. Despite that, it will take 2-3 hours due to the steep climb to Markha valley. The Markha river flows with a strong current and you will have to cross this furious river. The river level might be till knee, depending on the snowfall. The Markha valley is considered the largest because it has around 30-40 houses. For people interested in history, there are ruins of a fort. You can also find an old monastery that is believed to be built in the 1800s. Make sure to walk through the village and interact with the locals while sipping hot tea. Wake up all fresh and be happy as today will be an easy trek. The upcoming trail meets streams and Markha river several times serving as a refreshment. Umlung village is a tiny village, which can be recognised by houses and a monastery on the route. After Umlung the Kang Yatse peak comes to visibility and keeps calling you! Hankar village will be the next short break point. You can notice the Tacha monastery, skillfully placed on such a height. Hankar is also a camping site and one can have a night stay here. Trudge along the well-marked trail from Hankar towards a stone bridge. There are many routes coming out, you keep following the same path. In the next 2 hours, the pastures of Thochungtse become visible. There camping sites and tea houses here. Find yourself comfortable with the beautiful grasslands and rest for the day. This will be a short day filled with surprises. The sight of Kang Yatse gets closer and bigger. The trail is a gradual ascent of 700 meters comprising of 3-4 hours trek. This is a thoughtfully added day to help you get acclimatized to the high altitudes. You can consider this as a training day. Our team will be granting training on usage of technical equipment. 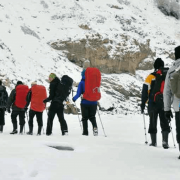 You will be taught how to walk in the snow, using crampons, handling of ice axe, and other techniques that are a must for the summit attempt. Try to grasp as much as you can. In doing so try not to exhaust yourself, as next will be the summit day. The delightful Kang Yatse peak will be staring at you throughout. Additionally, you can also go nearby for height gain trek. Make sure you give enough rest to your body for the summit attempt. Pack your backpack for the summit day, keep it light and easy. You will have dinner early to wake up midnight for the last climb. Hence, try to sleep early to get enough sleep. And the most exciting day rises! We will start midnight for the summit push to be at the top around 6 am for glistering sunrise. Carry packed lunch, refreshments and enough water for the strenuous climb. Today you will be rising from 5100 meters to straightaway 6200 meters. Therefore, being mentally strong is the key. The route to the summit is through the famous Kang Yatse shoulder. The trail starts with loose moraine and scree. Loose rocks make is difficult to secure the foot on the trail. Use a trekking pole for assistance. The route upwards has crevasses which are covered with snow most of the time. Based on the level of snowfall you will have to rope up for safety. Be careful and watch every step. The route goes to the north face through the northwest ridge towards a rocky outcropping. After a steep climb to the top, you will find the 360 degrees views of the Zanskar range, Karakoram peaks and mountains surrounding Kang Yatse. You might also notice the K2 peak (second highest peak in the world). You may also spot the distant Tibet mountains. The views are flawlessly satisfactory and will bring back all the energy to climb down. The entire summit path is 5 km each way. When you retrace your steps, be cautious on the scree and moraines. Make sure you return from the top by 1 pm to avoid further issues due to weather. Come back to the base camp to rest after the exhausting summit attempt. By Air :- Go Air and Air India provide daily (once every day) flight service between New Delhi and Leh. In the summer season, the services may even be provided twice a day. However if you plan a trip to this area of the country, you must try to book your tickets well in advance. This might even cut down the prices which may be levied on booking at the last time. You would enjoy the flight as you would fly over many untouched areas and even some mountain ranges. The aerial view is just fascinating and gives a great start to your tour. By Road :- The road from Manali to Leh is only open in the summers. The road trip may take you 2 days, but depending upon the weather conditions, the travel may also extend to 3 or even 4 days. You should also make sure that you carry at least two spare tires. A good advice would be to carry a sleeping bag with you well, as the bus may stop in the middle of nowhere for the overnight stay. Another route to Leh via Srinagar, also takes around two days. 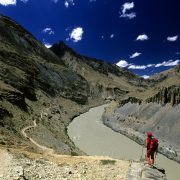 On this route, you would pass through some lonely yet famous villages like Kargil and Khalsi.